The Inspire Fitness 4 (CS4) Cardio Strider is one of those recumbent elliptical machines that have innovative and sophisticated features. It is at the top of the Inspire Fitness CS strider series. It features a sturdier frame that supports 350 pounds/158.7 kg maximum user weight capacity. The machine does not only have a low step-thru design but the seat swivels 90 degrees to the right and to the left, making it possible for the user to get on the strider from either side. Obviously, the Inspire Fitness CS2.5 and the CS3 Striders do not have all the features on this model hence it is the most upgraded of them all. The Inspire Fitness 4 (CS4) Cardio Strider has features that make working out a lot easier and more productive. The seat height adjustment is motorized; no need of pulling a knob and moving it aft/fore or upward/down. The pedals provide a linear type of motion that takes the stress off the joints, specifically the knees, hips and the lower back, great for a rehab purpose. The machine has 2 sets of handlebars; the moveable handles and the static handle that also has the EKG sensors embedded on it so that when held during a workout your heart rate data could be transmitted to the large blue backlit monitor. Consequently, you should be able to track and maintain your target heart rate zone at all times. In addition to that, the console is telemetry enabled so that the included Polar T31 chest strap could be used to monitor the pulse rate if you don’t want to grip the pulse sensors on the static handlebar. There are 12 preset programs designed to make your time spent on the strider worthwhile. This unit hardly has any downside that could be a deal breaker. Click right here to have a peek at the discounted price of the Inspire Fitness 4 (CS4) Cardio Strider on Amazon. The Inspire Fitness 4 (CS4) Cardio Strider is sturdy and also has innovative features that could help you actualize your fitness goals. It features a light commercial grade construction that supports up to 350 pounds/158.7 kg maximum user weight capacity. This means it has a higher user weight capacity than the CS2.5 and CS3 models. Its adjustability does not only allow users of different heights and sizes to be accommodated but it also allows users to quickly and easily adjust the seat and the handlebars to the desired position and even have the liberty of saving up to 4 different seat positions. It is slightly larger than the previous models and should require a little bit of space. Its overall assembled dimensions are 72 inches long by 36 inches wide by 55 inches tall. That is to say that the required workout space area for it would be 6’ long by 3’ wide area and a ceiling height of at least 7 feet. To ensure that safety and convenience are guaranteed, an extra clearance of 1-2 feet should be added at the rear and on each side of the machine. Its low step-thru design and the seat that swivels 90 degrees to the left and to the right is a big deal for most users especially those undergoing physical therapy rehab, arthritis, and the elderly folks. The CS4 is highly stable and grounded that no amount of an intense workout could make it wobble or move. It is stable because of its base framework that features a rounded steel stabilizer bar at the front and the rear bases. There are also rubber levelers underneath them which have the ability to grip onto the floor. It is grounded because the machine weighs 600 pounds/272 kg. Considering that this is a heavy machine and there are times when it will be necessary to move it from one room to another, the manufacturer puts one or two contingencies in place by integrating a solid handle at the front base stabilizer bar and two transport wheels at the rear base for hassle-free relocation. 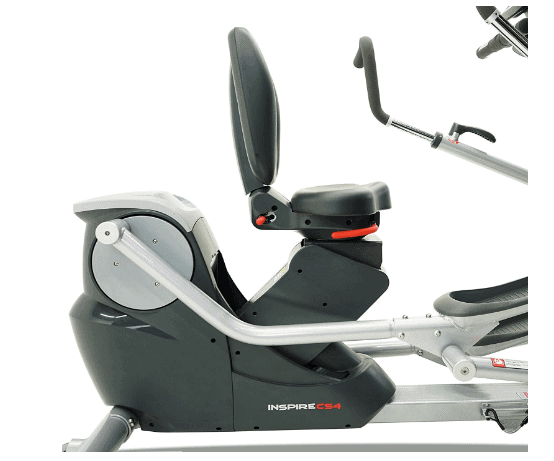 The Seat on the Inspire Fitness 4 (CS4) Cardio Strider is a recumbent seat that has a solid backrest. Both the seat and the backrest are padded and contoured to provide optimum comfort that enables the user to workout longer without even knowing it. The backrest could easily be adjusted to 3 different angles, while the seat has a motorized height adjustment (adjustment via the console)that saves you the trouble of doing so manually, and as aforementioned, the seat swivels to the left and to the right for easy access. It is also possible to save up to 4 different seat positions that could be automatically reused in a future workout without having to adjust a fresh position. The strider features a set of moveable handlebars and a static handle that has the EKG sensors embedded in it so that the user’s pulse could be read when held during a workout. The moveable handlebars make it possible for the upper body to be exercised. They have Quick Release Handles that could be adjusted all round so that the chest, back, biceps, and the triceps muscle groups could be targeted. They are also coated with a soft rubber foam material that provides comfort and a secure grip. The pedals are large; antiskid designed and they have 12-15 inches stride length. Their overall design provides linear motion (instead of circular motion) that eliminates stress in the joints. The Cardio Strider’s pedals allow your feet placement to be in front instead of below you, creating a back and forth leg reciprocating movement that feels natural. The Inspire Fitness 4 (CS4) Cardio Strider is equipped with a belt drive system. The drive system consists of a belt, a pulley, and the perimeter weighted flywheel. The drive provides a silent and smooth operation that makes it possible to train in front of the TV or listen to good music. The family or the neighbors won’t feel bothered by your exercise activities either. Moreover, the drive system is maintenance free; it doesn’t require any post lubrication or adjustment. The Cardio Strider CS4 has a frictionless electromagnetic resistance system that features 20 resistance levels suitable for everyone that wishes to lose weight and improve overall physical fitness with low impact cardio exercises. The resistance system is motorized; it is adjusted via the console. The fact that it is a frictionless resistance system means no wearing parts. 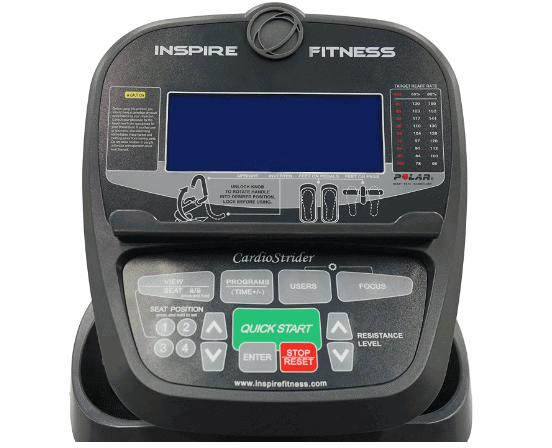 The console on the Inspire Fitness 4 (CS4) Cardio Strider has a lot of interesting and innovative features and these include the large blue backlit monitor, the several navigational buttons, the 12 preset programs, 10 user profiles, and the built-in tablet holder. The display has good readability that cannot be diminished by a poorly-lit environment. It displays workout data such as Watts, Distance, RPM, Calories Burned, and Pulse. The console is also telemetry enabled and compatible with Polar T31 Chest Strap which is included in the package. This means that you can use that to track and maintain your target heart rate zone instead of using the hand grip heart rate sensor. The 12 preset programs include 6 auto-resistance (rolling hills, mountain climb, peak, strength interval, and hill interval), 3 focus, and 3 heart rate. There are 10 user profiles available. This means that 10 users can store personal data such as age, gender, and weight that the machine need to accurately provide the users’ workout output. Two water bottle holders and a tablet holder are integrated onto the Inspire Fitness 4 (CS4) Cardio Strider. These are important and relevant accessories that help in achieving fitness goals. You can keep water handy in order to stay hydrated through a workout session and also be able to keep a magazine or a tablet device on the holder for entertainment purpose and taking calls as well while exercising. The storage of the Cardio Strider CS4 will require a little bit of space. It is slightly larger than the CS2.5 & CS3. It needs a storage area of 6’ long by 3’ wide and should be stored indoors, never to be exposed to excessive sunlight, moisture or rainwater. The relocation process of the machine is made easy (even though it is considerably heavy) by the equipped handle at the front base and the transport wheels at the rear base. The shipping cost of the Inspire Fitness 4 (CS4) Cardio Strider varies since the different vendors have their unique shipping policy. However, some vendors such as Amazon provide free shipping and delivers within days after the order has been placed. 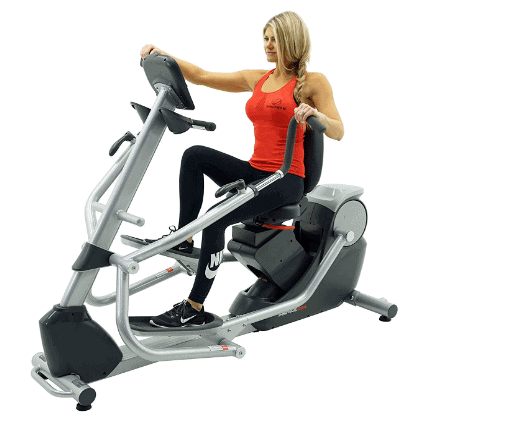 The Inspire Fitness 4 (CS4) Cardio Strider Recumbent Elliptical machine doesn’t come preassembled. However, it is delivered with the major components already attached. You are required to attach the front and the rear stabilizer bars, the console mast, the console, the seat, the handlebars, and the pedals to the core unit. There is also an assembly alternative on Amazon, where you could choose to have someone come over and assemble the machine on your behalf for an extra charge. The Inspire Fitness 4 (CS4) Cardio Strider doesn’t need any major maintenance that requires lubrication or adjustments. You need to always examine the Strider before use for any loose or broken part in order to prevent an accident or further damage to it. Then, you must endeavor to always keep it clean from dirt and sweat before and after use. The Inspire Fitness 4 (CS4) Cardio Strider is a suitable machine for physical therapy clinics and for home use. It is a rehab machine that provides quality cardiovascular exercises without making the joints sore.